With the rampant street crimes nowadays, we must ensure our very own safety and learn to protect ourselves anytime, anywhere with the help of this Portable Self-Defense Staff. 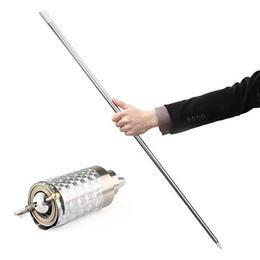 This metal staff extends from 5cm to 120cm in just seconds! In times of danger, you can silently pop it open and defend yourself from anyone. You can also carry it with you anywhere you like. With its concealable form, no one would ever notice you have it with you. With its durable build, it is frequently used in martial arts. Just press the button at the bottom and it will instantly release the staff.